My friend has faithfully shepherded the same church for more than a quarter of a century. He’s usually an animated, upbeat, high-energy guy…but not this time. He was unusually subdued. He looked, as they say out in west Texas, like he’d been “rode hard and put away wet.” Thankfully, he was embarking on a week of much-needed R&R. Instead of a one-week vacation, I wish I could give my friend a one-summer (or even a one-year) sabbatical. I’m so thankful I’m two years removed from my own experience of slamming into the ministry wall. How many thousands of ministers are hanging on by a thread? I don’t have to tell anyone that the stats and stories on burnout are shocking. It’s a real deal. So the pertinent question is how can a ministry leader tell if he/she is on a dangerous course? How can they avoid burnout? 1. You’re out-of-gas—in every way it’s possible to be empty. Remember at the end of Gone With the Wind when that most Southern of belles said, “I’ll think about it tomorrow. After all, tomorrow is another day”? That is oftentimes the mindset of the ministry leader who’s wavering along the cliffs of burnout. He/she keeps procrastinating and kicking the can down the road. Have you been postponing decisions? Saying for a month now that you really need to confront that passive-aggressive board member? Instead of picking up the phone and requesting a meeting, are you finding it’s much easier to pick up the remote? 4. You’ve forgotten how to have fun. You used to laugh, be silly and do spontaneous things. Now you’re just grim all the time. To Bob Goff’s “be whimsical!” mantra, all you can mutter is “bah, humbug!” If each morning brings only another day to be survived (instead of a wild, once-in-a-lifetime opportunity for possibility), you’re on a dangerous path. 5. You realize Al Pacino’s got nothing on you. I didn’t set out to be an “actor” (the Greek word, every pastor knows, is hypocrite). I suppose I was unconsciously adhering to the old “fake it till you make it” rule. I thought that if I kept doing caring things, my caring pastoral heart would eventually catch-up. One day I had an out-of-body experience. I saw my external self: Len (the clergy guy) smiling, patting folks on the back, acting like I was more interested than I really was, and pretending I cared more than I actually did. I was playing the role of pastor, and it was an Oscar-worthy performance. Truth be told, I was leading small groups and dreading it. I was preaching not because I had something to say, but because I had to say something—because it was Sunday again. That may be true for you today…your role and your soul are way out of alignment. Your public face and private face are out of sync. 6. You can’t stop dreaming about escaping. 7. You think the “witness-protection program” would be even better than winning the lottery. To exhausted pastors, the old quip, “The ministry would be great—if it weren’t for all these pesky people!” isn’t so funny anymore. You really would like to withdraw from people, join the Desert Fathers, or even go off the grid. I’m not proud to admit this, but on grocery store runs, I caught myself pulling my cap down over my eyes and praying I wouldn’t see anyone I knew. I wanted two things: to be anonymous and invisible. What about you? Do you find yourself pulling back socially? 8. You can’t reign in your brain. You know how when you’re sleep deprived, you can’t think straight? Well, when you’re spiritually and emotionally spent, your mind also plays funny tricks. My experience occurred like this: One moment my thoughts would be like a sugared-up pack of 1st graders inside one of those birthday party inflatable bouncy houses—running, screaming and colliding into each other. An hour later, I’d find myself in the mental equivalent of a sugar coma—lethargic, lifeless, crashed, unable to summon one simple thought. That’s not normal. 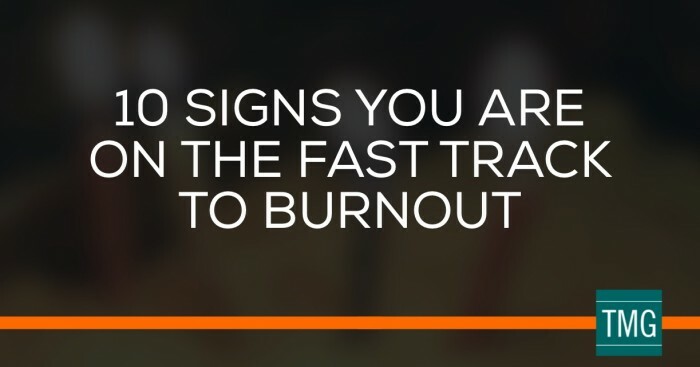 That’s one of the signs you are on the fast track to burnout. 9. You feel completely out-of-control. Every minister knows that “control” is an illusion. We’re always “in over our heads.” That’s why we smile when Paul asks in 2 Corinthians 3:5 who is adequate for such things? It’s why we nod when we sing the popular worship song that says “You call me out upon the waters. The great unknown where feet may fail.” The burnout we’re talking about here is a different beast. I felt for weeks (maybe months?) on end like I was being swept down a rampaging river—just trying to avoid drowning, just trying not to splat against a boulder. If you’re there, you know how scary that is. 10. You’re apathetic—and you don’t much care. I remember one particular staff meeting one May. Our children’s minister eagerly shared her summer plans for helping kids grow in the faith. Our student pastor spoke next, one-upping her with glowing details about mission trips and youth camps. In that vortex of enthusiasm, my honest, gut-level thought? “I don’t care about any of this stuff.” Not that I didn’t believe my colleagues were pursuing eternally important ventures. I just couldn’t muster up any kind of excitement. I couldn’t even summon the will to fake like I cared. That’s when I knew I was in big trouble. As you read, maybe you’re saying, “Me too, me too!” You might be wondering what to do next. If so, will you start with a couple things? Pay attention to these flashing lights on the dashboard of your soul. Your heart is trying to tell you something that’s both important and urgent. You know your heart. God knows your heart. Be honest with yourself and seek encouragement and support from those you trust. Seek out a leadership coach or a counselor. Pastoral leadership can be lonely, but you don’t have to do it alone. Len Woods is a graduate of LSU and Dallas Seminary. He spent almost three decades in church world (as a youth director, college pastor, small groups minister, senior pastor, and teaching pastor). A former magazine editor, he is currently writing full-time. Len enjoys coffee with friends, road trips, and dreaming of Colorado. You can find him on twitter @lenwoods.